The Peckham Coal Line in London, UK, has been billed as London’s answer to New York’s High Line linear park. It will connect the communities of Queens Road and Rye Lane in Peckham with a new urban park that will provide space for both pedestrians and cyclists, changing the lives of residents and businesses by bridging busy roads and creating a more direct link between two high streets. 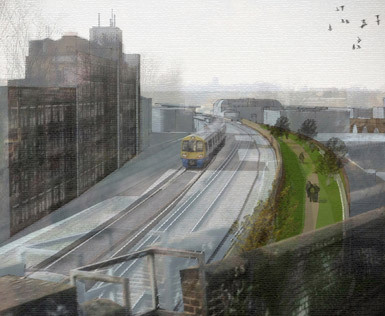 The 900m-long route will run on disused coal sidings alongside the railway line through the heart of Peckham, framing views across London and passing through Victorian brick viaducts before dropping down to a little-used nature reserve. The ambition is for the park to become a much-loved landmark – a carefully crafted green space that will offer breath-taking views across the ever-changing London skyline. As well as providing a beautiful setting, the improvements will bridge the gap in a wider network of cycling and walking greenways between Brixton and the Thames. The Peckham Coal Line Spacehive crowdfunding campaign has received a £10,000 pledge from the Mayor of London’s High Street Fund. This is a significant contribution towards raising £66,000 in start-up funds to transform disused railway sidings into a new 1km stretch of green space. It is the first time the Mayor of a major European city has used a civic crowdfunding website to directly pledge money to community projects. The Mayor’s backing comes after 300 other supporters including local residents and businesses have contributed to the project including the popular Peckham MultiPlex cinema. What began as a university project for Nick Woodford, a mature architecture student at Central Saint Martins, has captured the imagination of locals and Londoners alike. Since December 2014, when Woodford shared the designs on social media sites, he has built a small team of volunteer professionals to help create a long-term strategy. Over 500 people attended a series of public walks of the proposed route in May as part of the Chelsea Fringe Festival. Community involvement and feedback into the design process is a key component of the future plan.